Video-high by videohq is an adware application that will be installed on your computer if you download Jollywallet or any other similar browser extension. All of us want to watch HD videos online, especially as they are easily available on a number of video streaming websites. As a result, there are a lot of browser extensions that are supposed improve the video quality and enhance your video viewing experience. Video-high by videohq seems to be that kind of application, but take note that computer experts recommend removing Video-high by videohq from the systems on a basis of computer security. We cannot claim that Video-high by videohq is a computer infection or a dangerous computer security threat. It is indeed an adware program that functions like a browser extension, and to some extent it does help you stream videos easier. However, there are always two sides of the same coin. Since is a freeware application it supports commercial advertisements in order to sustain itself. Therefore, do not be surprised to encounter a lot of pop-up advertisements by Video-high by videohq when you browse the Internet. The pop-ups become especially pronounced when you access online shopping websites, for example eBay, Walmart or BestBuy. Apart from being bundled with Jollywallet adware, Video-high by videohq may also come with free installers and downloaders. Free installers are install managers that you download prior to downloading the actual program whenever you try to install an application via third party website. Not all file hosting pages have their own installers, but whenever you are offered one, it is best to decline the offer. Such installers often install additional software (like Video-high by videohq) onto your computer silently, and then later on you need to deal with a galore of undesirable and annoying commercial pop-ups. To display the pop-ups, Video-high by videohq makes use of Crossrider engine. Such behavior puts the application into the same category as TornTV, HD Plus, Lyrics adware and many other potentially unwanted applications. The pop-ups displayed by Video-high by videohq are first and foremost annoying, but we cannot ignore the fact that they might prove to be detrimental to your system security. In general, pop-up ads are not malicious, but they offer the first signal that something has gone awry. As long as you do not click the pop-ups, nothing bad will happen. However, if your browser cannot block all the commercial advertisements, then you surely need to remove Video-high by videohq, along with other related applications. For full computer protection, scan the system with SpyHunter free scanner and then get yourself a powerful computer security application that will take care of your computer’s safety. Go to Uninstall a program and highlight Video-high. Under Programs press Uninstall a program. Click Video-high to highlight it and then press Uninstall. 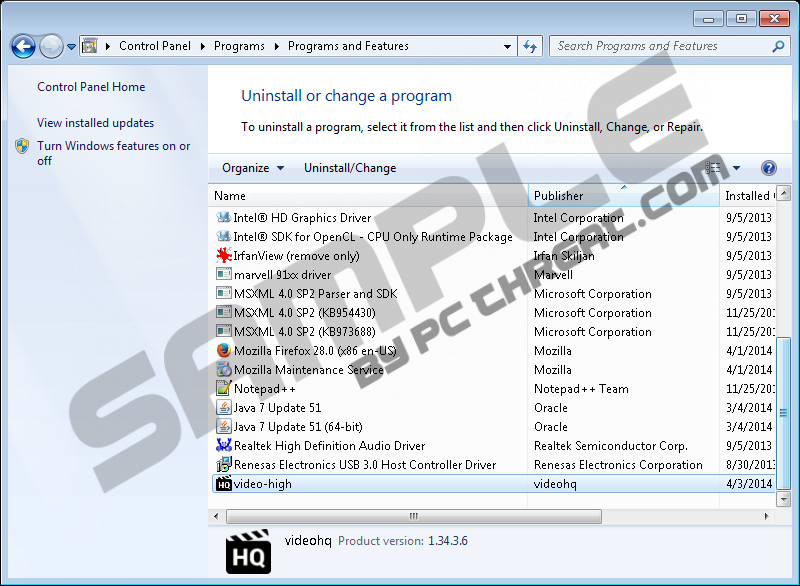 Select Add or remove programs and uninstall Video-high. If you encounter problems removing the application, or you need more information on computer security, please leave us a comment below. Quick & tested solution for video-high by videohq removal. I have tried repeatedly to uninstall video-high software that my nephew accidentally installed on his computer. Nothing I do will remove this software. My antivirus catches it but can not quarantine the program. Any help would be welcome.